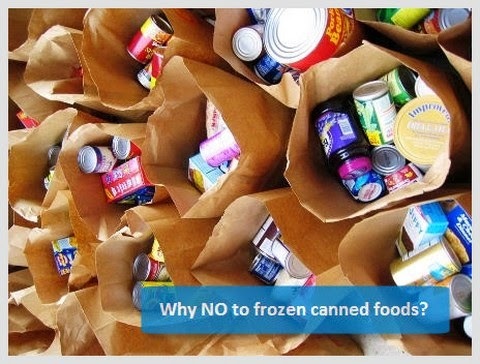 Why Frozen Canned Food Is Bad For Your Health? With the advent of technology, human has developed new habits affecting his daily routine. Daily diet and eating routine are two such habits that have drastically changed in the last 100 years or so. Two to three centuries back in time, most part of our daily diet used to be fresh food. But as new refrigeration and preserving technologies came into existence, we started to rely more and more on packaged frozen food. In some parts of the world, our reliance on frozen canned food has reached alarming percentage. What are its negative implications on the human body and how to revert back to a healthy diet plan? Let's try to see the pros and cons of including frozen canned food as a large part of our daily diet. Readily available - With supermarket or a departmental store at the corner of your street, you're assured of regular supplies of ready-made food. Simply open, microwave (if required) and start consuming. Freedom from cooking - Large percentage of refrigerated canned food requires no or very little cooking. This relieves you from the hectic cooking routine, especially if you're going to serve to well over a dozen people. More choice - Although a good cook can prepare infinite number of recipes, canned food consumers also have enough options at their disposal. There are dozens of preparations to tryout and one can mix two or more frozen food varieties to get a completely new dish. Freshness at stake - We all know the goodness of fresh food! And that's what missing in frozen canned food. While purchasing such food, you can never be assured of its freshness. Missing natural taste - No matter how well you package a vegetable or any other eatable, a frozen food pack never can taste natural like a fresh one. Often companies add enhancers and flavoring agents to cover this shortcoming. Improper freezing dangers - If such food is not kept at the right freezing temperature, it starts decomposing within the can. This is one of the biggest reasons why sometimes people find rotten food within the can as they open it for the first time. Nutritional difference - If you're comparing fresh food with a canned alternative nearing its expiry date, you'll find a significant difference in the nutritional ingredients. Fresh food almost always wins in such cases. Heavy on the pocket - If you're buying frozen canned food on a daily basis for a large family, you'll find your bills considerably larger than the bills for the same amount of fresh food. This occurs due to the inclusion of packaging and refrigeration costs in the overall price of the product.